When I moved to LA in 2010 the very first thing I asked people was: “Where should I eat?” Their very first response was normally: “Kogi BBQ!” But whenever my schedule opened up, Kogi BBQ was in the depth of the OC and I’m not about to waste 60 miles of gas for tofu tacos. 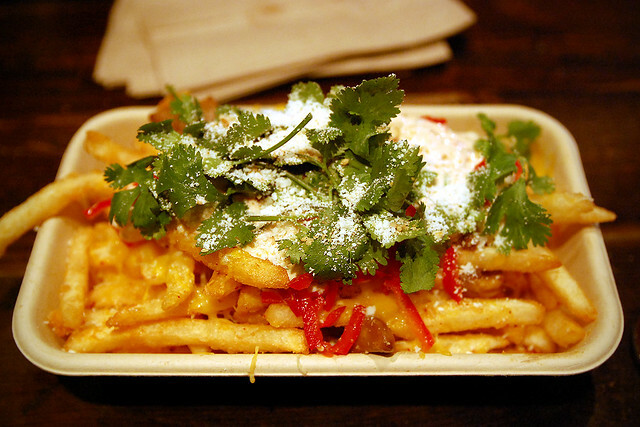 Fortunately, Chef Roy Choi had also opened Chego in Culver City. 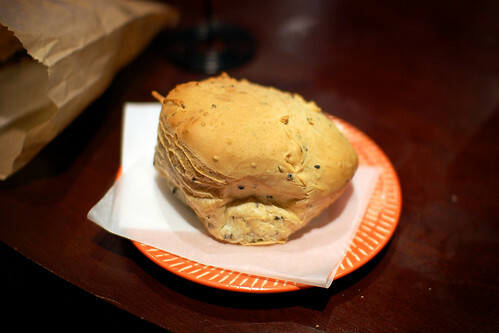 Still, the long dinner queue usually shooed me away to less hyped restaurants. When I finally tried Chego, it offered exactly what I expected: A mediocre vegetarian option. At the north end of the Larchmont Blvd shopping district sits Brick and Scones, a swank library-quiet wi-fi haven well known by locals. It’s the study you wish you had at home. 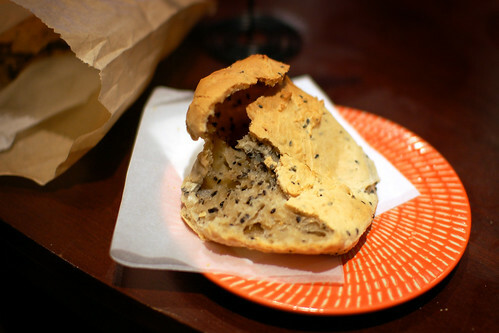 But all of this is beside the point, because the point of being here is to eat Korean-style Chewy Sesame Rolls! 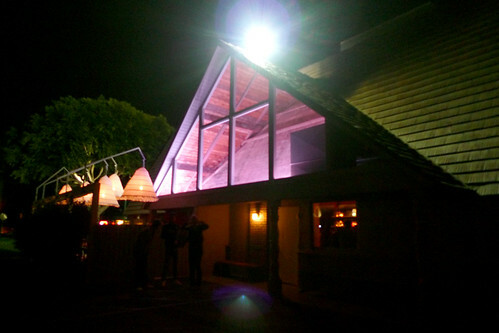 As a native Culver City girl, I’m absolutely floored by the bunny rabbit style growth of the restaurant scene in my little town. I may live in East LA now, but when I heard that one of the hottest new restaurants had popped up in my old hood, I had to go asap! 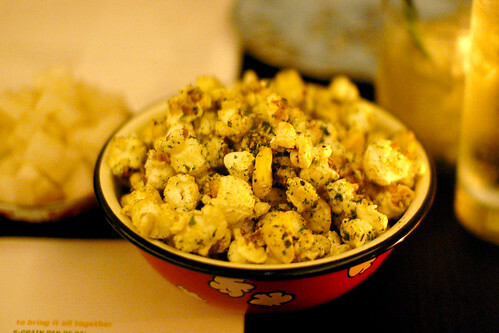 First out, the Furikake Kettle Corn ($5) Blazin’ Jay’s, Hawaiian Style. The kettle corn is richly buttered with the salty sweet goodness we all know and love, but then rocketed into the gourmet stratosphere with the addition of puffed corn, sesame seeds, nori flakes, and a blast of spiciness. The punchy mix is sourced from local popcorn vendor Blazin’J’s – watch out J, the word is out, and your booth will surely be blazin’ with foodies in the future. Along with the kettle corn, we ordered the Moooooo Kimchee ($3)—a modest plate of cubed white radishes swimming in lactic brine. 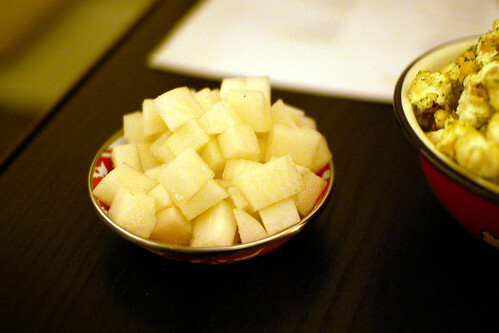 Other than the salty brine, these bite-size dices of crunchy daikon bear no resemblance to kimchee. We selected this over the Heirloom Pickles because my friend doesn’t like “pickles.” She was later surprised to discover the pickle plate wasn’t all cucumbers. Instead it was an earthy mix of carrots, parsnips, red radishes, and something that looked like an apple… maybe an Asian pear?